Photoshoots are one of my favorite parts of my job. It’s when the conceptual turns to the actual and when all of the dreaming turns into a reality. I love planning the location, the concept, the wardrobe, the styling…sometimes I have to pinch myself. It seems surreal that these decisions are mine to make - that I get to share my voice and my point of view with the world in this way. Shooting a spring/summer collection in Chicago can prove to be tricky since the snowdrifts, leafless trees, and gray skies don’t exactly inspire the appropriate vibe. We were lucky enough to have the opportunity to shoot at Billy Parisi’s studio, which gave us tons of light and white space, exactly what I was looking for. I am so excited to introduce you to the models and photographer who made this shoot possible! For the spring collection, I wanted women who represent women - a broad scope of beauty. So let me introduce you to the three women who are all over our website! The gorgeous blonde in our photos is a friend and fellow female entrepreneur, Bonnie. She is passionate about helping women live healthier and cleaner lives. 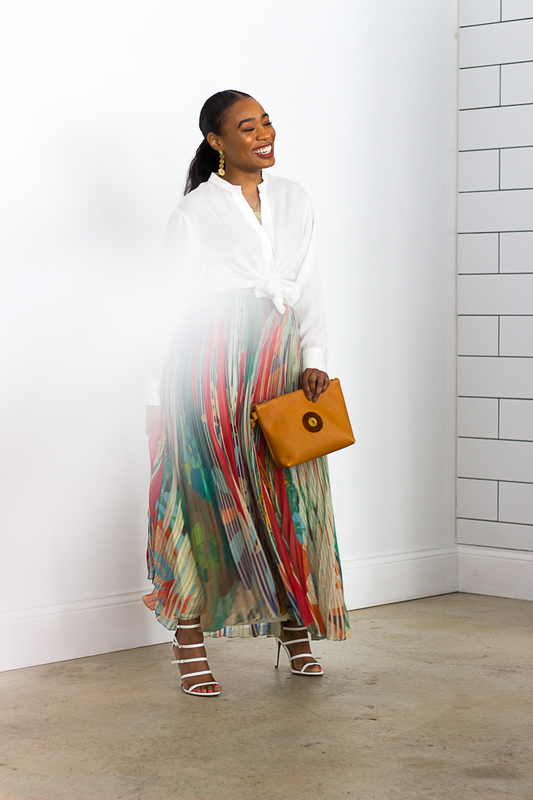 As an advocate for change in skincare and makeup with BeautyCounter, she loves connecting with women and helping them become more informed about how to take the next step to living a healthier lifestyle. Check out her blog, Time to Come Clean for more information! I had followed Britt for a long time on Instagram before ever meeting her in person, and she is just as beautiful in person as she is in her photos. In addition to fabulous style, Britt is passionate about self-care and self-acceptance…two things that are so hard in a time when busyness is synonymous with importance and social media tempts us to compare our squares to everyone else’s. Check our her blog here! Britt wearing our Keely Clutch in Tan, Alexandra Earrings, and Marcella Necklace. Mickey is a Jack (or Jane) of all trades! She is a photographer, stylist, and model. For this project, I knew I wanted to utilize her modeling talent as she is effortlessly stunning. In person, she couldn’t be sweeter or more humble - she is a joy to work with and we’ll definitely hope to work with her again! Check out her website here. Our photographer, Sarah Ling, was an absolute dream to work with! Sarah and I met a few years ago while we were both ambassadors for Noonday Collection and we eventually traveled to Uganda together. Sarah is one of those people who you just feel connected to on a soul level. She’s full of love and creative energy just pours out of her in the most beautify way. Of course, she and I didn’t get a photo together…but here is her website - she’s doing lots of cool things with design, photography, and fair trade! Everything was lining up perfectly to have a fabulous photo shoot. But life wouldn’t be life if there wasn’t a little hiccup, right?! The morning of the shoot we found ourselves locked out of the studio because our key didn’t work. We came to find out that the key was newly made and none of us tried it the day before when we came to pick it up. Thankfully, an employee was able to come let us in, but not after we spent an hour waiting outside in the cold! Although the cold was a little annoying, what I was really worried about was it throwing the entire day off. I needed to steam clothes, get everything up on the rack, unpack jewelry, etc. all before the models showed up. Needless to say, our morning was a little rushed, but once we got it, we were off and running. I absolutely love how the photos came out…and some of the outtakes and candids are my favorite ones. It shows the real life as opposed to the edited and filtered. I’m so thankful for these women who worked so hard to make my vision a reality! 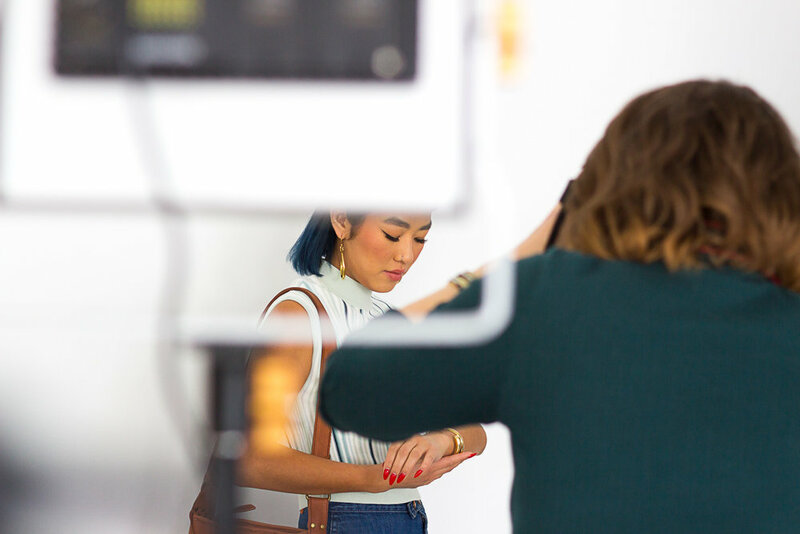 From Sarah breaking pottery for the product shots to Bonnie, Britt, and Mickey bringing some clothes from their own closets to fill out the wardrobe…it takes a village to make a small business go! A special thanks to Yana, from Nomad Luxuries, for her help with wardrobe styling!